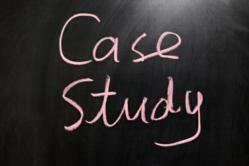 A case study is one of the best ways a small business can highlight its products or services. A convincing, easy-to-understand case study showcases business skills and experience. The international brokerage firm Compagnie Financière Tradition needed more up-to-date analysis on the performance of its brokers for a true picture of the firm’s financial health. As noted in a recent case study, when Compagnie Financière Tradition turned to IBM's Cognos Express business intelligence software, it found the results it was looking for. A case study is one of the best ways a small business can highlight its products or services. A convincing, easy-to-understand case study showcases business skills and experience. It offers tangible evidence that a small business can achieve for prospective clients, while also adding value in itself (as a story of how the business solved a particular problem). “Best of all, a case study serves to indirectly endorse products or services, particularly when enthusiastic client testimonials are added to the mix,” says Jeremy Durant, Business Principal at Bop Design, a San Diego web design agency. Situation. The opening paragraph describes the client’s business and the challenge it sought to overcome. State the client’s situation objectively, including the negatives (keeping in mind the client will likely read the case study). Results. For the case study to have genuine impact, specific numbers should help lay out your case. “Just saying your solution increased the number of new customers for your clients isn’t very compelling,” Durant says. “On the other hand, stating before working with you, your client averaged five new customers a week and they now average 50 customers a week is extremely powerful.” Highlight results, but don’t exaggerate or be dishonest. Avoid insider jargon (including industry-specific acronyms). Readers are turned off by terms and phrases unknown to them. Keep sentences short and punchy, with paragraphs of no more than four or five sentences. Subheads also make the case study more reader-friendly. Remember to include your website, contact information and call-to-action. What should readers do after they finish reading the case study? An eye-pleasing design also helps draw readers into a case study. Use brand colors and incorporating both the client’s logo and the small business’s own logo in the piece. Include graphs and charts that are easy to grasp in a glance and add credibility to the case study. Sometimes text boxes enhance the overall design, highlighting key facts and benefits covered in the case study. Bop Design is a San Diego web design agency with offices also in San Diego and the New York metro area. We express a business values through branding, advertising, design and web design. We also help attract a firm's ideal customer through search engine optimization and search engine marketing. The marketing firm's focus is on small businesses that want an external team of marketing specialists to help give their brand an edge in the marketplace.